Now resident in Berlin, Australian DJ/producer Emerson Todd has found favour with labels like Saved, Upon.You and Apparel. Now, he turns out the 17th release for Danse Club Records, which features one original cut plus remixes from Sascha Dive, label heads Brodanse and Nathan Barato. ‘Love Somebody’ is a subtle, slow burning deep house track with starry melodies, crispy percussion and a seductively deployed male vocal whisper. A big bassline sweeps up from below to really beef things up, possibly creating one of of the best things Todd has done. Up first to remix are Brodanse themselves, aka Scott and Austen Smart. Their mix is a more full fat, rounded and rich tech house groover with warm bass, chattery percussion with probable dancefloor appeal. Next up is Sascha Dive, boss of the Deep Vibes label. 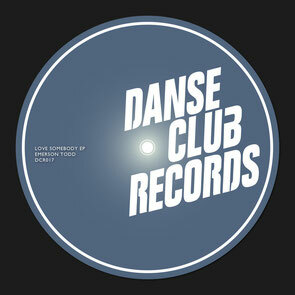 His Dy-Na remix repackages the track as an organic, humid cut with woody hits, nice dubby chords and a direct groove. Last up is Canadian Nathan Barato, who steps up to round out the package. His version is druggy and stripped back, texturally rich and almost militant in its groove. It’s the sort of busy, heady track that will encourage floors to get freaky in the dead of night and offers something different from the original.